Submitted by breadforfun on April 21, 2015 – 1:06pm. My two last bakes shown in the photos below differed primarily in the overall hydration. 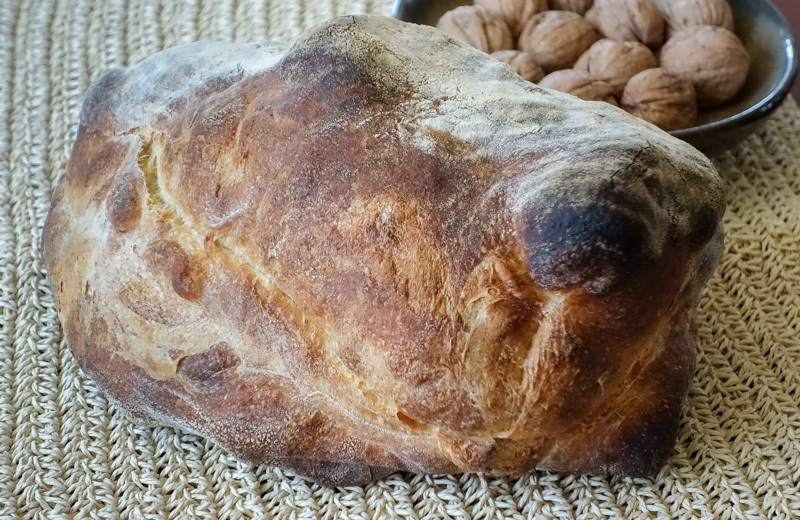 Most of the formulas available indicate hydration around 65% for Pane di Altamura, which I stuck with at first. 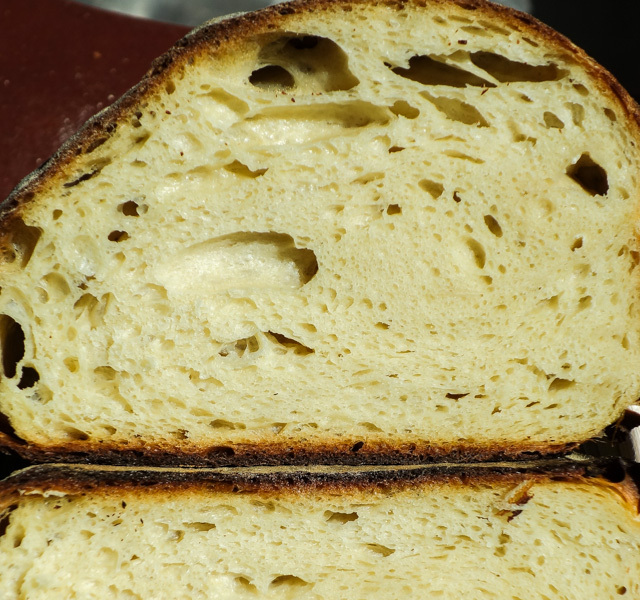 The dough was easy to work with, but it was quite stiff, and the resulting crumb was very closed and tight. The aroma was lovely and taste was mild and somewhat sweet. 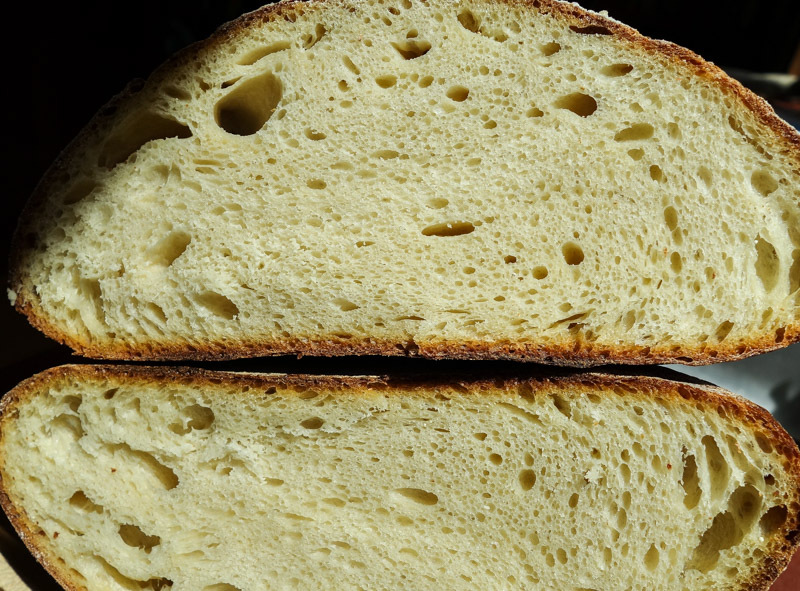 The sourdough flavors were mostly undetectable. My shaping technique is still not perfect, although it is improving. 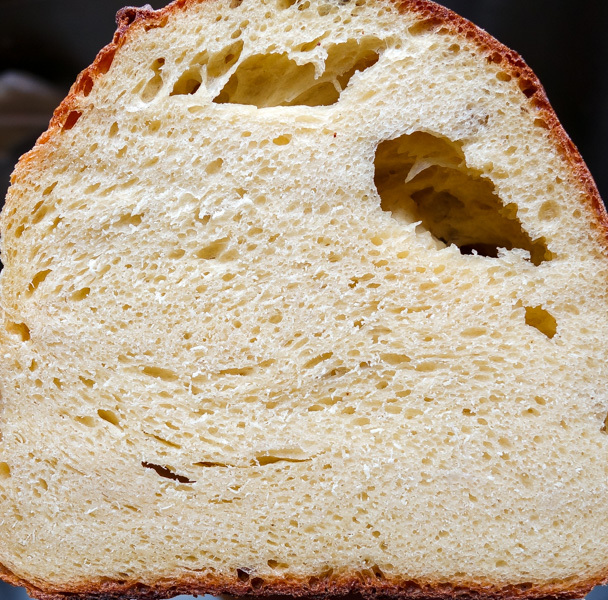 The finished loaf is pictured at the top of the post and the crumb is shown here. 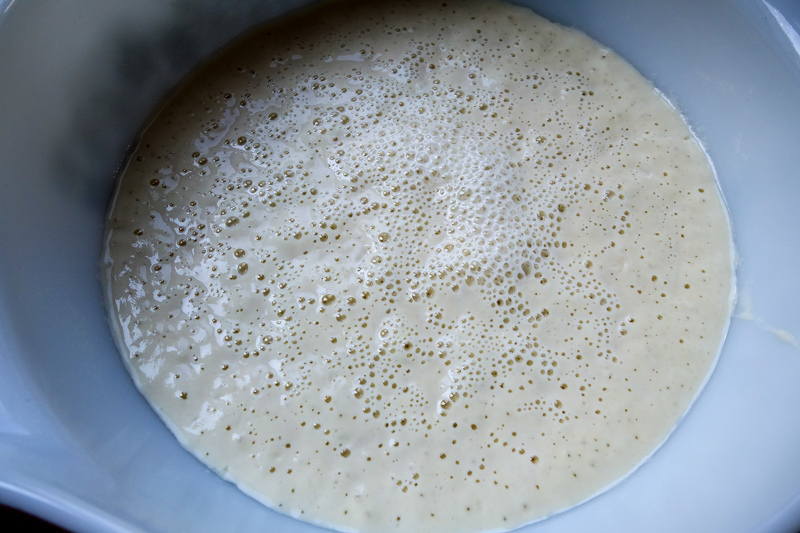 On the most recent bake I increased the hydration to 72%, more like the minimum I would use for a wheat-based sourdough. Keeping with 20% preferment, I split the batch into 2 loaves and shaped them into boules. One loaf was proofed for 2½ hours and baked as a boule. The second was retarded overnight, then shaped in the traditional folded loaf and baked the next morning. No steam was used during the bake and the oven was propped slightly open during the first 15 minutes of bake. Boule an crumb with 72% hydration dough. Final dough weight ~1300 grams (this large because it makes it easier for me to accomplish all the folding needed to shape the loaves) kneaded for at least 20 minutes, plus 4x S&F for the first 2 hours. Bulk ferment 3 hrs @ RT, final proof 2½ hrs or retarded overnight. Baked in a falling oven for 1 hour, starting at 460˚F and finishing at 400˚F, dropping the temperature in 2 steps, without steam. They both had chewy crusts and the crumb less so, but had a bit of resistance. The folded loaf had noticeably more flavor and a more pronounced but not overpowering sour tang and came out really tasty. 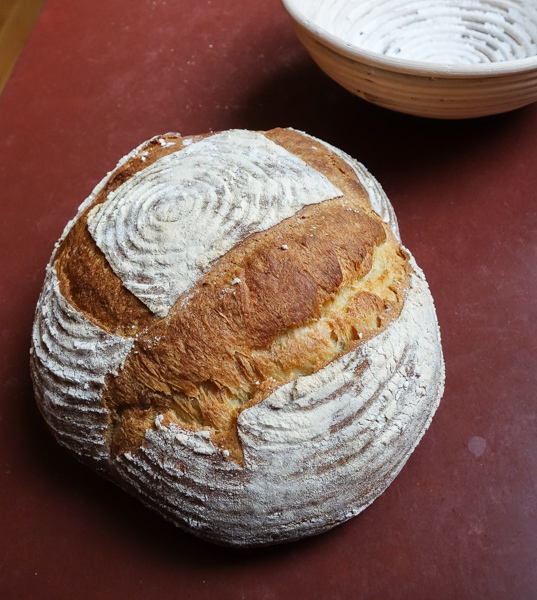 Another major difference was that the crumb of the boule that was scored was drier than the boule shaped in the folded loaf form, which was quite moist. They were baked with roughly the same temperatures and times but clearly the scores allowed more water to evaporate. They both had thick crusts reminiscent of the authentic loaf. I plan to extend the baking time and lower the temperature more quickly for the next folded loaf to dry it out a bit more.